Beijing witnessed one of its better annual liver-testing occasions about a week ago when Torres China held Taste of the Nations VI, an event that gave attendees access to a free flow of 180 wines from 14 countries for rmb228. As usual, the offerings went beyond entry-level fare to wines in the rmb250 to rmb500 range. Also as usual, it saw some end-of-day stragglers enjoying a few final gulps straight from the bottle. You stay classy, Beijing! 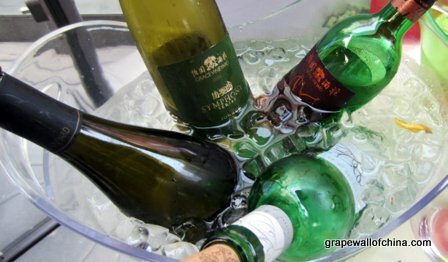 Grace Vineyard ‘Symphony Series’ Muscat 2010, China (rmb178): The most striking of the five Chinese white wines on the day, this one was aromatic with zingy grapefruit and fresh peach up front and a dry mild finish. Ought to work with plenty of foods. Silver Heights Family Reserve 2010 (rmb291), China: This 50-50 blend of Cabernet Sauvignon and Cabernet Gernischt was decanted and had blackcurrant and green pepper smells, a nice mouth feel throughout, and a slightly spicy finish. Coppola Director’s Cut Zinfandel 2009, United States (rmb376): A juicy wine with wild dark ripe fruit and deep red licorice smells, thought it was lighter than I expected. Marimar Estate Acero Chardonnay 2008, United States (rmb363): Fresh vanilla, nut and stone fruit smells, a lovely and round body, juicy and some spice at the finish. Callia Syrah / Malbec 2011, Argentina (rmb83): Toasty, fruity, even jammy smells. Also lots of fruit in the body, maybe a bit too much, though this one is good value. I wish I’d tried the Callia Torrontes and the Salentein range from Chile, including the Chardonnay, Malbec, Merlot and Cabernet Sauvignon. 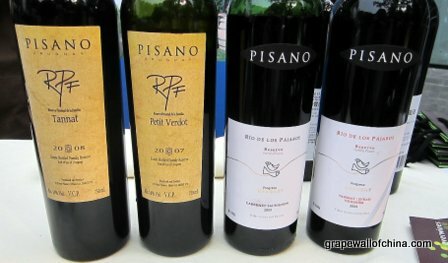 Pisano RPF 2008, Uruguay (rmb286): An initial sense of sweetness up front, with a smooth, bordering on silky, body. Nice tannins and a touch of oak spice. If you haven’t had a Uruguayan wine, try this one. The “interesting” award goes to Tyrell’s Rufus Stone Heathcote Shiraz 2010, Australia (rmb344), which several of us found minty — someone also said “medicinal” — and might be that elusive wine to be drunk while chewing Wrigley’s Spearmint. Anyway, you can try Torres’ wines at the new Everwines shop on Xindong Road — if you want to drink on site, either on the patios or in the lounges, you simply pay a rmb50 service charge on top of the retail price.